To download the 2019 Vendor Application click this link. Thank you once again for all your hard work and effort to present such a well run, artist friendly craft show. The pre-show communication was thorough, timely, and helpful. Sheila and Jill thank you and your families and staff for all the hard work you put ino this event. It is very much appreciated and you deserve kudos all around! Thank you for having us. We are looking forward to next year's event.. Thank you for continued excellent advertising and organizing. The weather was with us, the crowds were fantastic. This is one of our cornerstone shows and has been over the years. Thanks Shelia and Jill. I did have a successful 2days. ​Thank you for all your work organizing the show! I had a great time despite the heat, and very good sales this year! I wanted to again personally thank you both for the invite to your Collingswood event. It was a very good show for us and we were grateful and humbled by all the complimentary feedback we received from customers. I know how much effort and work goes into running such an event and you deserve kudos for such an organized, well run, friendly and successful show. We look forward to more events with you. Thank you Sheila and Jill, we've already marked the show on our calendar for next year and will enter as soon as we receive the application. I'm not sure if you keep a record of artists sales but I wanted to follow up on what I reported to you at the show this year. My impression at the show, and what I told you was that my sales were "medium". After I tallied my sales the following week, it turned out my sales were better than I had thought. So I wanted to upgrade my sales report to "good". Also, I wanted to thank you guys for placing me in a spot according to my wishes. To prevent my wooden pens from cracking, they needed to be out of the direct afternoon sun, the spot you placed me in did just that. I'll be back next year and will be requesting the same spot! Thank you so much for a great show and yes the customers came out anyway and they were there to buy despite the very hot weather!! I had customers who told me they came to the show especially to find me and they were so happy that I came back to the show this year and I will definitely come back again next year!! Yes, I will pray for cooler weather next year!! I was very happy with the customers who decided to come to the show!! They really support the Collingswood show and I also had many tourists who came from out of town to the show as well!! I love the t-shirt too!! Thanks again for putting on a great show!! Thanks for the info! It as a well oranized festival. I will definitely apply next year. We can't tell you how much we love this Festival. It is so well organized and vendor friendly. It is true that is was very hot and humid and our business was down a bit HOWEVER we will always do this show as long as you will have us. Thanks for yet another fun and fantastic (and profitable!) 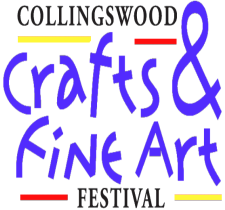 Collingswood Crafts & Fine Art Festival. Very well run as always, to the point the level of quality is expected and the effort is unnoticed. That is a high compliment. It's tough work to stay good and even harder to make it come off so seamlessly. You folks do it, and I notice it and appreciate it. Keep up the fantastic work. See you next year!